Having some extra fat around the midsection is not just something that is less than attractive: It can also be an indicator of bigger health problems, such as cardiovascular disease and type 2 diabetes. If you're committed to exercising to slim down your waist, you may wonder whether certain types of exercise are helping. Finding out doesn't require a scientific process. Contrary to the "spot reduction" myth, you must do exercises that burn overall body fat to lose inches. Identify your maximum heart rate -- the maximum number of times your heart can beat per minute -- by subtracting your age from 220. Calculate the target heart rate -- the ideal number of times your heart should be beating during exercise to reap the most calorie-burning and cardiovascular benefits. Your target heart rate should be between 50 percent and 85 percent of your maximum heart rate, so multiply your maximum heart rate by 0.5 and 0.85 to find that range. 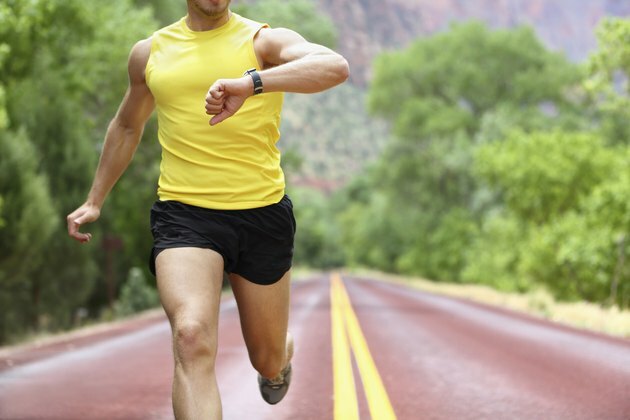 Check your heart rate when you're exercising. Following your warm-up and a few minutes of exercise, place your index finger and middle finger on the carotid artery, where your neck meets your jaw. Count the number of beats in a minute, or count for 10 seconds and then multiply that number by six. If your heart is beating between 50 percent and 85 percent of your maximum heart rate, you're within the ideal range for burning calories. If you find that you're on the lower end of that spectrum, try to increase your intensity, as the higher end of the spectrum will help you burn more calories. Keep track of how long you exercise and your general heart rate so you can estimate how many calories you've burned through exercise. Use a "caloric burn estimator" to estimate how many calories you've burned during a session, and then write down that number in a training journal. Count the number of calories you're consuming every day. To lose 1 pound of body fat, you must create a deficit of 3,500 calories. Use an online tool that estimates the number of calories in certain foods and another that estimates how many you should be eating for your age and weight. Compare your daily caloric intake with the estimate for your age and weight to find out whether you're creating the deficit you need in order to drop pounds. If not, eat fewer calories or increase your exercise time and intensity. Try high-intensity training one or two days a week. According to the American Council on Exercise, HIIT can help you burn more subcutaneous belly fat and increase your metabolism for the whole day following the workout. After a short warm-up, exercise at about 90 percent of your maximum intensity. This might include running or swimming at a sprinting pace, for example. Maintain that speed for about one minute and then slow down to about 50 percent of max for another minute. Switch between the two a total of eight times, and then cool down. The "fat-burning zone" is purportedly the heart rate range at which your body utilizes more of your fat stores to fuel your workout. This range is about 55 percent to 65 percent of your maximum heart rate -- the low end of the target heart rate zone. Exercising in the fat-burning zone, however, burns fewer fat calories and fewer glycogen calories than you'll burn by exercising at a higher intensity.